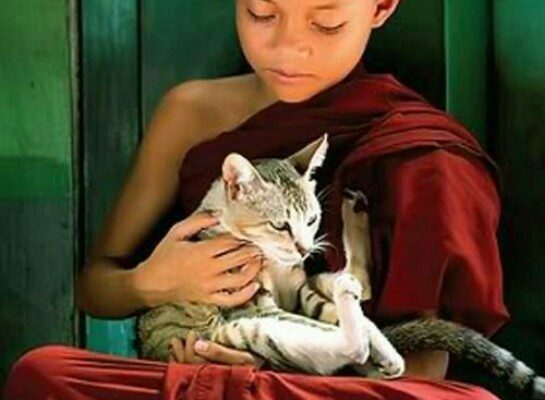 Buddhism is a non-theistic tradition, meaning that it does not involve a belief in God. The focus of Buddhism is on the nature of mind. What concerns Buddhists is an understanding of how consciousness works, not only in theory but more importantly in practise. Our goal is to take charge of our own mental continuum, both for our own benefit as well as for the benefit of those around us. 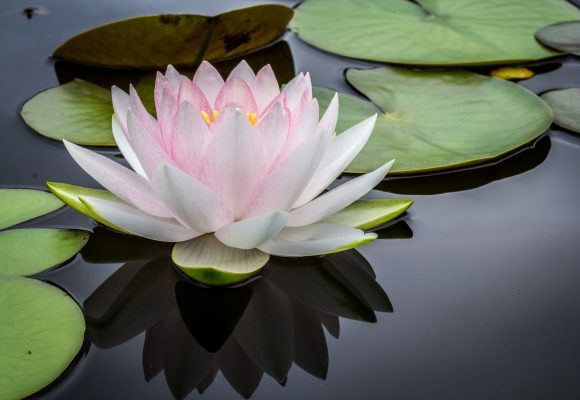 We are offered not only a comprehensive tool box of techniques to help achieve this, but also a living tradition of more advanced meditators who provide living evidence that we all possess the innate potential of subtle consciousness, the nature of which is a boundlessness and radiance beyond anything that most people ever suspect. Buddhists don’t invoke God in any of this. Does that make us atheists? 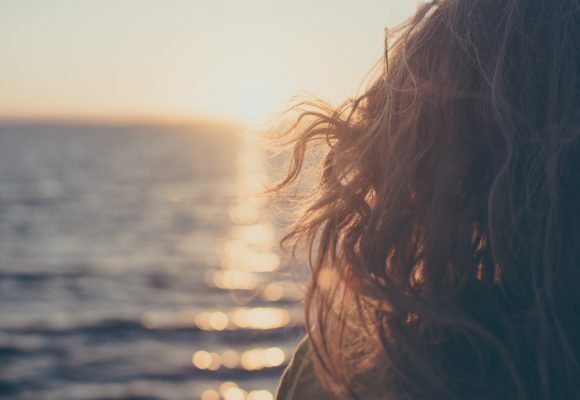 In my view – and I should stress that this blog is necessarily personal – the answer to that question depends on two things. The first is your definition of atheism. If you define atheism as the absence of a belief that God exists, then you might say that such a definition equates to the non-theism of Buddhism. But atheism can go way beyond the absence of a belief. Some atheists don’t merely lack a belief in God. They have a strong, emotional investment in the belief that God does not exist. To me, these atheists seem every bit as intolerant of alternative views as religious fundamentalists – not to mention as evangelical in their determination to convert others to their own point of view. It is not good enough for them to believe that God does not exist. They want to impose their beliefs on everyone else. Buddhism is definitely not on the same page as this version of atheism. The second, much more interesting matter, is how you define God. If you have, as your starting point, a notion of God as the uncle in the attic, then there is little common ground. If, on the other hand, your starting point is that there can be only one ultimate reality, that the nature of this reality is beyond concept, that, over the past few thousand years different cultures have pointed to this non-conceptual reality in a variety of ways, and that ultimately we are all on the same journey, as Albert Einstein put it, ‘to attain liberation from the self’, then this is somewhere that different traditions can perhaps find some common ground. Which perhaps goes some way to explaining how one of the first members of the Tibetan Buddhist group I belong to, was a Christian monk! 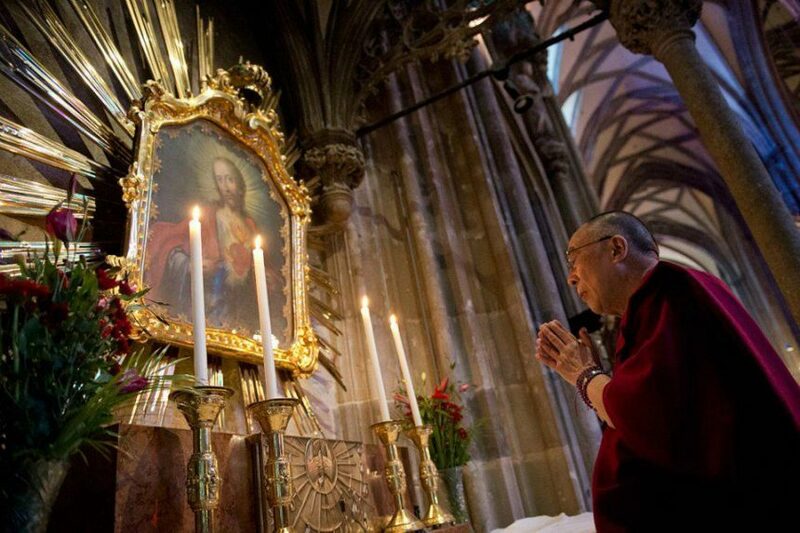 I’ve chosen as an image to accompany this post, a photo of His Holiness, the Dalai Lama at St Stephen’s Cathedral in Vienna, Austria, in 2012. The Dalai Lama has always urged people to stay with the tradition of their own culture, and to use Buddhism, not to become Buddhists, but to become better Christians, Muslims, atheists or whoever-they-are. For more blogs, Subscribe at the top left of your screen now! I would never think a Buddhist could be considered atheist. And the number one reason is atheist believe this is it. You live you die and that is it. Goodbye. No more you never exist again. My understanding is that Buddhist in essence believe that you live and die and that the core being the thing that makes a living being that part is reborn. For me Buddhism is closer to being Wiccan you live you learn you practice. 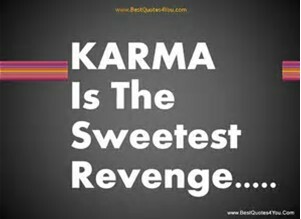 You never do harm as everything you do comes back to you 3 fold. So always do good. Many thanks indeed Jane for your contribution! I think there may be a little confusion some times about definitions. Aetheists disbelieve in deities, so buddhists can in fact be aethists, as ideas of soul, eternal existence, reincarnation, or any such ideas however you want to describe them are not incompatable with there being no god, just so long as this beings/process/mechanisms are not derived from deities or god/s, which of course they do not have to be. When the authors says “Some atheists don’t merely lack a belief in God. They have a strong, emotional investment in the belief that God does not exist.” this is actually a better description of Antitheisim, which is, by the nature of the subject also a belief system; dis-belief. Many noisy self-styled aetheists who make themselves about as popular as religious fundamentalists, are actually antitheists, though probably do not have the wit to realise it themselves. I personally am an Antitheist too, though find a lot of common grounds with Buddists as I believe strongly in discipline and harmony of the mind, and in absurdism, which accepts the futility of trying to understand ‘the big picture’. Hopefully I am an Antitheist who carries themselves with a little more grace than the likes of Ricky Gervais… though extras is very funny! On that note, something you said in todays blog about atheists makes me somewhat uneasy and has inspired me to finally post a comment. I think the very nature of the word ‘atheist’ (a=absence of, theist=god/s) is negative, which kind of helps propel the idea of atheists being mean-spirited, nasty, joyless people. At least that’s what I, and most others in my church used to think when I was a christian. Since I have become an atheist (with Buddhist tendencies), myself, I have found that it couldn’t be further from the truth. I have found more love and acceptance of myself and others than I ever had as a practising christian. If I read you right, it seems to me that you are lumping fundamental atheism (for want of a better phrase) in with religious fundamentalism and saying they are as bad as each other. I disagree – first off, I have never met an atheist who has been evangelical in trying to convert me or anyone else to their views, most I know are of the ‘live and let live’ ilk. If however, by that comment, you are referring to the likes of Dawkins, Hitchens et al., then I think they have been so vociferous in recent years because of necessity, e.g. when religion interferes with teaching fact in state schools, then someone has to say something. Secondly, and I hate to say this but I will – atheist fundamentalists aren’t generally inclined to strap bombs to themselves and blow themselves and everyone around them up in order to honour their beliefs. I like what you say in the last paragraph about other religions using Buddhism to become better at whatever they are. Unfortunately, in my experience anyway, such open mindedness is rare – at least within the Abrahamic religions, which is a great pity. The Christian Monk you mention must have been a rare diamond! Anyway David, keep up the good work! Hi Carol, Many thanks for sharing. I agree with most of what you say – and it’s important that belief is not presented as fact in schools. Also, when it comes to suicide bombing, I’m not sure it has a contemporary equivalent in any other belief system. Well written Carol and interesting……the comment …. Thanks so much for your comment, Helen. Yes, it’s useful for people to have many different perspectives to consider! When I was a child of seven and surrounded by other children on Sunday at Sunday School in our church our teacher informed us that we would all go to the altar in formation to ‘Let Jesus into our hearts…” I stayed in my seat because I felt this was not the way to do such a thing. The teacher gently insisted I join the group but I resisted, and said “…I have already let Jesus into my heart…” ( a non-truth). She smiled and told me to open the Bible and start with the very first verse of Genesis and keep reading until everyone returned from letting Jesus into their hearts. I did as I was told. I watched the others kneel at the altar and felt disconnected, afraid, but not alone. Later that night I got down on my knees at my bed and apologized to God for not participating and then ‘asked Jesus to come into my heart’. I am almost 52 now. I know only one verse in the Bible: Genesis 18:14 A Is anything too hard for the Lord? I believe and have always believed that “God” is me–inside and all around me. I am able to transcend the limits of binding beliefs to experience the beauty that we are all capable of. And I am not alone. Thank you, David. That childhood experience formed my world view and being ‘Atheist’ has opened my eyes to so many possibilities. While the Buddhist view is my guiding force, I wonder at what other approaches to life are out there. Peace and Harmony. I found your definition of atheism very limiting and rigid. You provided 2 definitions, an absence of a belief in god and a deep rooted conviction that there is no god. I am sure there are more shades of grey than that, but my main concern is your assumption that all people who are convinced there is no god are as ‘intolerant of alternative views as religious fundamentalists’ and determined to convert others to their views. Really – all of us? I would not dispute that such individuals exist, but to categorise all of us who do not believe there is any kind of god, in one narrow and rather hateful definition. I agree with Carol, in that I have never met such an atheist and throughout my life I have mixed with many ordinary rather than well known atheists. Carol mentioned Richard Dawkins. I believe that individuals such as he have become increasingly pressured to speak up more and more strongly due to the negative attitudes which have been displayed more and more to prevent the ‘live and let live approach. This attitude is prevalent in most if not all religions although clearly not by all worshippers, the most extreme being those claim to represent Islam while killing and maiming without discretion. I would just like to add that many people whatever their personal beliefs still like to follow aspects of other religions while trying to live a good life. And my final word – love the cat! I have for many years called myself a Christian Buddhist. I do this because I was raised as a Catholic and feel this gave me the impetus to continue seeking. Also, as I live in a largely “christian” area, I need to give others a way to not feel threatened by me, or try to persuade me from the “error” of my ways. I hope to be like a small trickle of water to find my way and perhaps allow others to add to the flow. I enjoy arguing with G-d whenever I don’t understand and find acceptance not within my grasp. This is what I think the Dalai Lama means when he encourages us to be the best we can be within our culture. Thanks for posting these wonderful thoughts. I have yet to read your works, but I will begin soon. Peace, David. It all depends on the definition of God. If you define your God (or gods) as another sentient being in Samsara, with extreme powers or abilities, then it might exist, we’re just not speculating on its existence or wishes. This is non-theism. If you define God as an absolute being, that is impossible. It would have non-empty nature and inherent existence, and we realise that is not possible. Therefore we deny that kind of God, and this is atheism. Either way, Buddhism is based on intentions, not blind faith. So we don’t aim to make people believe this or that; just help them do whatever leads them to better understanding, better intentions, and ultimately, happiness. I have read most of the above posts. You appear to attract nice people to your blog or possibly you also influence them to write nicely with your replies. Reading it has been very enjoyable. David, I think what you take as being angry, militant atheism is the distress many atheists, myself included, feel when observing what religion has done, and is continuing to do, to our world. As a Yoga Teacher I was invited to a camp in the Swiss mountains one time, Our Swami, always said just the exact same. we do those studies to become better people not to change religion.